After a long weekend of stag party shenanigans in Valencia I was shattered. I couldn’t even look at a beer, let alone drink one. And my body was rejecting all but the plainest of foods. So arriving in Taragona, about two hours north of Valencia by train, chilling out was the only thing I had on my mind – I needed to build up energy for the upcoming Fiesta de San Fermin in Pamplona. 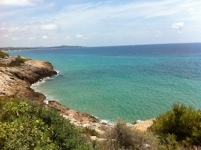 I couldn’t have picked a better spot for my recuperation – miles and miles of lovely sandy beaches just a short walk from an intriguing old town with its labyrinth of narrow cobbled streets. As I write this the sun is shining and I’m sitting on the terrace of a beach bar with an amazing latte. I’ve even found an English newspaper. Bliss. The Romans were the first to occupy Tarragona, in 218BC, and in 27BC Augustus made it capital of a province covering most of modern day Spain. Such was the importance of this place that some of the grandest public buildings in the Roman world were constructed here. 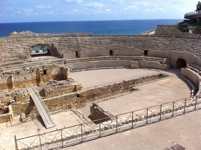 You can see and visit many Roman remains in Tarragona, like the well-preserved amphitheatre where gladiators battled animals and each other to death. There is also part of the Roman Circus, including its imposing arched stoned vaults, where chariot races were held. It is amazing to think that for a city of 40,000 the various public entertainment venues could hold 50,000 combined. But some of the most fascinating finds are lurking in the basements of modern buildings or indeed holding the contemporary constructions up. The Roman rubble was re-used so many times over that you see tomb stones in the walls of more recent additions to the city for example. Tarragona was abandoned when the Muslims arrived in 714 but then thrived again in Medieval times thanks to the Christian church. The grand cathedral, built on a vantage point in the old town originally occupied by a Roman temple, hails from that comeback era. “If the gods deny me Rome as my native land, at least let me remain here. What can I say, but that custom is a powerful force? A city that, if you wish to believe a man like me who has seen so much is the most agreable of all those that can be chosen for rest. In it you will find oh guest and oh friend, honest, sober tranquil people, who will take time, no doubt, to be hospitable, but who are this way with sound reason.